Tesco (UK) Archives · Stop the Cap! One of the largest grocery chains in the United Kingdom is giving away free unlimited 16Mbps broadband for a year, including a free wireless router, as long as customers cover the usual monthly line rental fees. The service is offered without a voice dialing plan, which means customers will pay for any voice minutes they use, except when those calls are to or from Tesco Homephone customers. Internet customers also receive a free year of Tesco Internet Security and UK-based phone support. The optional phone service also includes Caller ID, Caller ID blocking, and Directory Inquiries. In fact, Tesco’s offer will actually be a money-maker for customers who already have home phone service because Tesco also includes Clubcard points on every bill, which can be redeemed on purchases made at the chain. After 12 months, the price reverts to Tesco’s current standard offering: 16Mbps for $9.68 a month. Tesco’s line rental charge, required on all landlines and DSL service costs $24.83 a month. In comparison, CenturyLink charges $39.95 a month for 10Mbps service for a year before the price increases. But customers will pay considerably more than that, as that price does not include taxes, fees, and surcharges, including a Carrier Universal Service charge, National Access Fee surcharge, a one-time, High-Speed Internet activation fee, and state and local fees that vary by area and certain in-state surcharges. A monthly modem rental fee also applies. British supermarket giant Tesco is reportedly preparing to offer budget-priced fiber broadband service to shoppers, according to ISPreview, which discovered the offer on a hidden web page. Customers will be offered unlimited use 38Mbps entry-level service for around $12.50 a month for the first six months, and $25 a month thereafter. A one time charge of $83 applies unless customers enroll in an 18-month contract. A fiber activation fee of $75 also applies. A wireless router is provided for free after a $8.25 shipping and handling fee. Tesco frequent shopper Clubcard members will also earn points good for shopping discounts when subscribed to Tesco’s broadband service, which effectively further reduces its monthly cost. 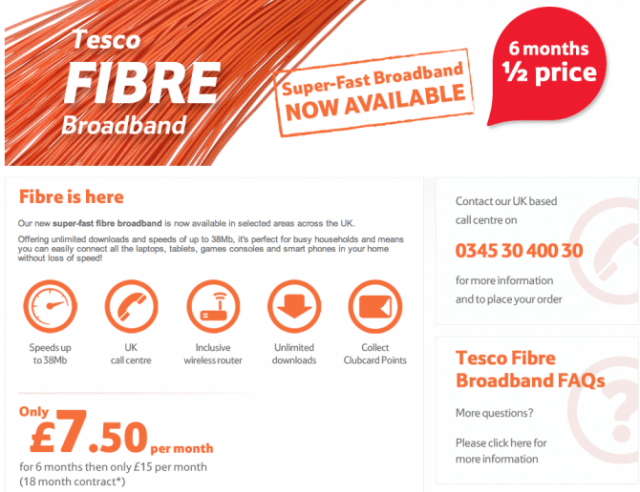 Unfortunately, existing Tesco broadband and home phone customers will not be eligible for the fiber promotion. “If you currently have both a broadband and a home phone service with us, unfortunately we currently cannot upgrade you to fiber. We’re working on this and plan to roll it out Spring/Summer 2014,” read a statement on its help and support website. In contrast, Americans pay an average of $63 a month for 25/5Mbps usage-capped cable broadband, including equipment rentals and surcharges, where applicable. Can you drop by your local supermarket and walk out with a year of free home broadband service? In the United Kingdom, Tesco shoppers can. For several weeks, Tesco shoppers have been offered a “Broadband and Phone Deal” that will return $117 in savings during the first year by waiving the cost of the broadband part of the package. Tesco Broadband normally runs around $9.75 a month on a one year contract for up to 14Mbps unlimited-use service including free installation and a free wireless modem/router combo. Customers are asked to pay a $24 monthly BT line rental charge, but part of these fees are returned to Tesco shoppers as part of the supermarket chain’s rewards program which supplies vouchers based on the amount spent on Tesco products and services. There are many ways to spend with Tesco. The chain is the second largest retailer in the world behind Wal-Mart and sells books, clothing, computers, software and electronics, furniture, music downloads and DVD rentals, and operates a financial services division that sells auto, home, and pet insurance to UK residents. It entered the telecom business years ago selling rebranded services from other providers, notably BT, formerly British Telecom.